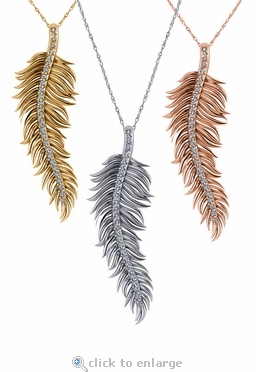 The Feather Pave Cubic Zirconia Pendant can be worn to symbolize a sign from the angels. 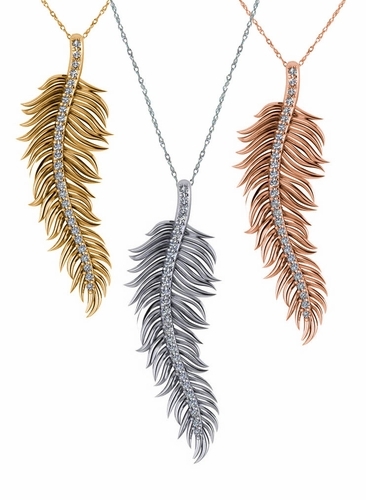 This stunningly designed pendant is a life like version of a real feather with a pave lined spine and flowing feather plumes. The feather features approximately .30 carats in total carat weight and secures with a hidden bale. This pendant comes standard with a 16 inch chain and an 18 inch chain is also available. The feather measures just under two inches in total length. Choose from 14k white gold, 14k yellow gold and 14k rose gold. Each pendant sold separately. Please see the pull down menu for all options. For further assistance, please call us directly at 866-942-6663 or visit us via live chat and speak with a knowledgeable representative.